Located at the confluence of the Mississippi and Ohio Rivers at the southernmost tip of Illinois is the town of Cairo, pronounced “Care-O.” By far, one of the strangest and saddest cities I’ve ever visited, I am immediately intrigued by the empty streets and abandoned and crumbling buildings. We pass under an arch depicting “Historic Downtown Cairo” to take a peek at this city that has been standing on the river for more than 150 years. 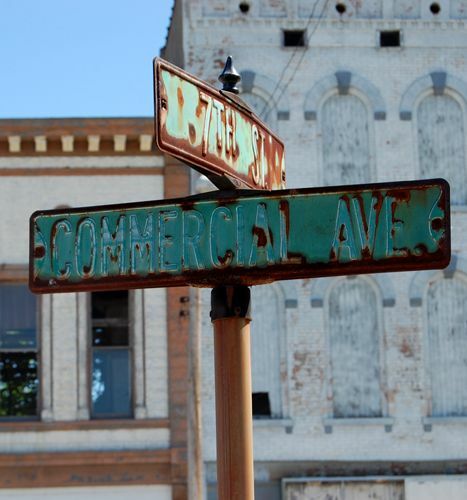 Though the town has a population of some 3,000 people and is the county seat of Alexander County, its Main Street, called Commercial Avenue, is empty of people and lined with buildings in various stages of decay. 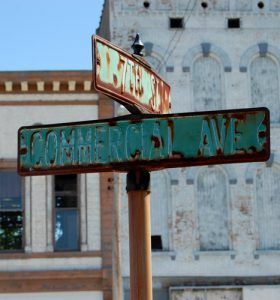 Doors stand wide open on commercial buildings that display rubble filled interiors, windows are broken or boarded up, Kudzu crawls up brick walls, streets signs are faded and rusty – the streets and sidewalks are cracked and choked with weeds. On a side street, the once lovely Gem Theatre stands silent next to the Chamber of Commerce. In other parts of the city, the large brick hospital is overgrown with vegetation, churches are boarded up, and restored mansions sit next to abandoned and crumbling large homes. What has happened here? I’m sure, with Commercial Avenue’s proximity to the Ohio River, the town has been devastated by a flood; but, I don’t know and find no one to ask. Finally, after wandering about the deserted buildings for a time, an elderly gentleman parks his truck and walks out along the river. I stop and ask him. He tells a brief story of how the town was destroyed by its own residents and points out a building that once served as a fine dining and dancing establishment that he and his wife enjoyed decades ago. Cairo died because of racism. The peninsula where Cairo now stands was first visited by Father Louis Hennepin, a French explorer and missionary priest in March 1660. It was noted again by other traveling priests over the next few years, but, it would not be settled until 1702, when French pioneer, Charles Juchereau de St. Denys and a party of about 30 men built a fort and tannery a few miles north from the confluence of the Ohio and Mississippi Rivers. The party of men was extremely successful in collecting thousands of skins for shipment back to France. However, the next year the fort was attacked by Cherokee Indians who killed most of the men and seized the furs, effectively ending the life of the fort and tannery. Nearly a century and a half later, Lewis and Clark left Fort Massac, Illinois and arrived in the vicinity of what would later become Cairo in November 1803. Here, they worked jointly on their first scientific research and description; to study the geography at the junction of the Mississippi and Ohio Rivers. On November 16, they began the diplomatic phase of their journey when they visited the Wilson City area of Mississippi County, Missouri, and met with Delaware and Shawnee Indian chiefs. They ended their surveys at Cairo on November 19th, and proceeded up the Mississippi River, now working against the current. A depiction of Commercial Ave, looking east from 10th Street during its heydays. The first attempt at settlement occurred in 1818 when John G. Comegys of Baltimore, obtained a charter to incorporate the city and the Bank of Cairo from the Territorial Legislature. He bought 1,800 acres on the peninsula and named it “Cairo,” because it was presumed to resemble that of Cairo, Egypt. Working along with Comegys, was Shadrach Bond, who was the first governor of Illinois. These men and other speculators invested and tried to develop Cairo into one of the nation’s great cities. The land of the peninsula was to be made into lots and sold, a portion of the money put into improvements, and the rest of it was to constitute the capital of the bank. The peninsula was surveyed and a city laid off. However, when Comegys died in 1820, his plan died with him. 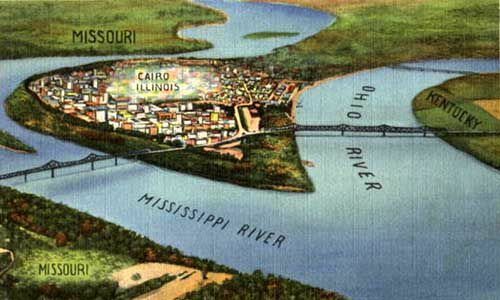 But, he left behind a contribution in his choice of the name Cairo, and as a result, “Egypt” became the popular nickname for southern Illinois. A second and successful attempt at settlement began in 1837 when the Illinois State Legislature incorporated the Cairo City and Canal Company, with Darius B. Holbrook, a shrewd businessman from Boston, as president. Holbrook soon hired several hundred workmen who constructed levees, a dry dock, a shipyard, sawmills, an iron works, a large two-story frame hotel, a warehouse, and several residential cottages. A store was kept in a boat. The city’s future looked promising as work on the Central Illinois Railroad brought a great many people to the vicinity of Cairo. In the meantime, a number of farms were established and area villages in the county were flourishing. Commercial Avenue in Cairo in the 1850s. The settlement was widely advertised in England, where the bonds of the Cairo City and Canal Company found eager purchasers through the London firm of John Wright & Company. However, when the London firm failed in November 1840, the fledgling town of Cairo immediately declined, dropping in population from 1,000 to less than 200 within two years. Those who remained operated shops and taverns for steamboat travelers. The census of 1845 showed 113 people in 24 families. For more than a decade, the “town” languished, but, in 1853, the company began to sell lots in anticipation of the railroad arriving in the area. 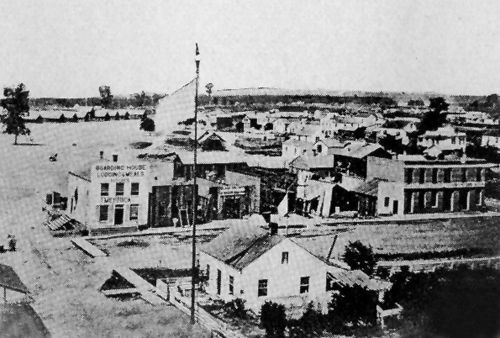 When the Illinois Central Railroad was completed in 1856, which connected Cairo to Galena, Illinois in the northwest corner of the state, the town really began to grow. At that time, expectations were still running high when Cairo was predicted to surpass St. Louis, Missouri, Louisville, Kentucky; and Cincinnati, Ohio as an urban center. Some even recommended that the city should become the capitol of the United States. Of course, despite these boasts, the city did not prosper to such an extent. 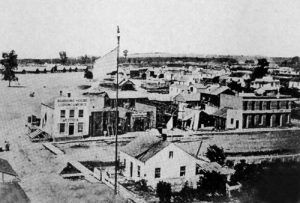 In 1858 the town was incorporated and two years later, its population exceeded 2,000. It quickly became an important steamboat port, as goods and supplies were moved further south to New Orleans. In 1859, the city shipped six million pounds of cotton and wool, 7,000 barrels of molasses, and 15,000 casks of sugar. 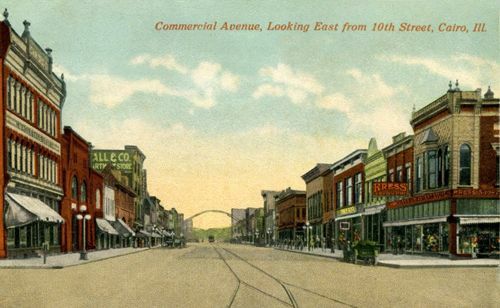 In 1860, Cairo became the county seat of Alexander County. An elegant courthouse was built in 1865 that continued to stand until the 1960s when it was torn down and replaced with a new one.